A new webpage for the Reserves covering summer 2005 and 2005-06 season is here. The latest Lancashire League table is here. I hope to have brief details of the final two matches of the season from manager Neil Brown shortly. Once these are available, the Who Played Where and Appearances/Goalscoring statistics for the season will be put on the website. Altrincham Reserves lost 0-1 to Burscough Reserves at Moss Lane on Thursday. Alty Reserves got revenge yesterday for their heavy defeat at Workington on the opening day of the season. In that game Workington had used their first team, which has since been top of the UniBond Premier all season. But yesterday, without that advantage, the Cumbrians were well beaten. Report to follow. Alty Reserves will play home games at Moss Lane next season following the departure of Manchester United's Reserves from Altrincham. Entry will be £2 and hopefully spectators will find the matches much more accessible than those this season at distant Abbey Hey, especially those played on midweek evenings. The Reserves' next game will be played at Wythenshawe Town at 1pm on Saturday against Workington. A chart listing everyone who has played or been a sub (used or unused) in this season's Altrincham Reserves' games is here. At present it lacks the used substitute statistics but these will be added soon. Goals from Joe Daley and Anthony Wealle secured an excellent 2-1 win for a much-weakened Altrincham Reserves today. Report to follow. Altrincham Reserves have played most of their home games at Abbey Hey this season. Though the club has been very welcoming, the fact that the pitch is used by numerous teams as well as Abbey Hey, means that the playing surface has suffered. In fact, Danny Johnson, mmanager of our neighbours Trafford said, after his team's game at Goredale Avenue, "Losing at Abbey Hey was extremely disappointing... It didn't help us much playing on possibly the worst surface I have ever seen at this level of football". A report on the Reserves' win over Lancaster last Wednesday is here, courtesy of information supplied by Neil Brown. Altrincham Reserves have five games left this season, all at home. The fixtures are here. They include several Saturday lunchtime games. A report on their last game, a win over Lancaster City will be on the website later this weekend. Altrincham Reserves beat Lancaster City 3-2 on Wednesday in the Lancashire League. Youth team striker Lee Hendley and Rico Richards were scorers of two of the goals. I hope to have a report on this match in the near future. Despite playing some very good football, Alty Reserves lost today. Lee Hendley scored Alty's goal. Report here. Pictured above is the Altrincham Reserve team which faced Guiseley today. Five regulars were missing due to work commitments or injury so, hopefully, there will be an opportunity for another team photo including them later this season. Pictured above, left to right are: Back - Carlos Marsden (coach), Laurence Ball, Mike Brown, Adam Brindle, Craig Ellison, Ranel Williams, Pat Connolly, Lee Hendley, Neil Brown (manager). Front - Todd Cunliffe, John Thompson, Paul Monaghan, James Marsden (capt. ), Paul Tilley, Ashley Brown, Arron Hevingham and the mascot. Alty Reserves lost 1-4 at home to Morecambe last night, the margin being a little harsh on the Robins, who won the corner count and had a lot of second-half possession. Alty's goal came from Tony Wealle. Report here. Altrincham Reserves' manager Neil Brown lost a very impressive two stones during the recent STAR Slim4ALty contest - details of the final results are on the STAR website. Neil weighed in on 1 January at 18st 8lbs and by mid Fenruary had lost almost 28 lbs (10.8% of his body weight) to weigh in at at 16st 8 and a half pounds. He finished fifth in the overall competition. At the current rate of weight loss, Neil should become lighter than air by Spring 2006! If you agreed to sponsor Neil, please don't forget to give him your sponsorship money as soon as possible. Alty chairman Geoff Goodwin has agreed to match whatever funds Neil raises. Alty's away Reserves' match at Morecambe has been moved from 16th to 15th March so as not to clash with the Alty first team's Cheshire Senior Cup Final appearance against Crewe Alexandra on the 16th. Alty's next game is on Saturday 12th March away to Accrington Stanley at a venue to be confirmed. All of the March fixtures are now here. A goal from Anthony Wealle after half an hour saw Alty home at Bamber Bridge on Saturday. Report to follow. The team line-ups and other information about the Altrincham Reserves' matches at Lancaster and Southport are now available via the Fixtures page. On Saturday (26th) the Reserves are away again, at Bamber Bridge. Alty Reserves lost 3-1 at Lancaster on Thursday night. The Lancashire League table is here but it is not totally correct even though it is based on the League's own website. The Reserves lost their unbeaten run with a 3-0 defeat at Vauxhall yesterday but they were very much weakened by injury, unavailability and call-ups to the first team squad. Goals from Lewis Chalmers and Danny Grimshaw secured a 2-1 win for the Reserves today. Report here. Tonight's Reserves' game at Abbey Hey against Guiseley Res. has been postponed due to a waterlogged pitch. The next fixture is another home game, but switched to Robin Park, Wigan, at 1pm on 29 January against Leigh RMI Reserves. Reserves' central defender, Adam Brindle, who has been on the first-team bench several times this season has signed for Curzon Ashton on loan to get more match practice. The updated league table is on the Fixtures Page. Radcliffe Borough "manager Kevin Glendon... hopes to set up an official reserve team that will hope to play in the Lancashire League along with fellow non-league teams such as Accrington Stanley, Morecambe, Altrincham and Southport". Radcliffe "at the present time has a U 19 side that plays in an open age league the Altrincham and District league". Alty's January fixtures have now been sent to the club and are here, along with updated league table, which Alty are climbing rapidly. The next match is at home (Abbey Hey) on 5 January to Accrington Stanley (7.45pm). Altrincham Reserves play their home games at Abbey Hey and the NW Counties site reports that "Abbey Hey... are about to celebrate another significant date in 2006. That year marks the twentieth year since beginning to play at the Abbey Stadium... Secretary Tony McAllister explains, 'We are in negotiation with a number of people to raise funds for a complete upgrade. Like most clubs we are looking at maybe installing an Astroturf pitch as well as a complete refurbishment of the social club'. The ground as it stands was mainly developed by the committee who have in the main been with the club for thirty or forty years but sadly it has seen better days. Vandalism is, as with many clubs, a constant worry. Tony says, 'Youngsters just get in at night and we are unable to prevent it, we built a new retaining wall but as fast as we build it, it just gets knocked down again. Once in the ground, they are not content to just sit and drink. We have had our seats burned out and they have even had a go at replacements that were donated by Manchester United. This is a major pity as the ground is well used by the local community'. As well as the newly-formed Abbey Youth, the stadium plays host to Manchester City Ladies, Altrincham Reserves, Curzon Ashton Reserves and Robinsons Sports College as well as a variety of charity events. The club, with the support of the local police and the club's Management team, has embarked on a series of awareness-raising events in local schools and youth clubs in an effort to combat the problem. Players will go in to offer coaching sessions and talk to the young people who are allowed to use the training area on match days. Alty Reserves made it eight games without defeat with a well deserved draw against a Vics' side which included six players who were in their first-team squad for last Saturday's Conference game (Connett, Royce, McCarthy, Carratt, Hughes and Quayle). There were two old Alty faces in their line-up; Mark Quayle and Jason van Blerk. Alty included former Sheffield Wednesday, Queens Park Rangers, Chester City, Stalybridge Celtic and Boston United midfielder Alex Higgins (23) who gave an impressive display on his Alty debut on a difficult pitch at Abbey Hey. Alty Reserves extended their run to seven games without defeat and four straight victories with a 2-1 win at Burscough last night. A brief report on the Reserves win over Bradford PA is here, courtesy of manager Neil Brown. For the second time in a week an Alty Reserves match had to be postponed due to a double-booking of a pitch. This time it was on Friday at Gt Harwood where Accrington Stanley were to host Altrincham Reserves in the Lancashire League. Alty Reserves' good form continued with their biggest win of the season against Bradford Park Avenue last Wednesday. Amongst the scorers were Rod Thornley (2), Kieran Lugsden and Lewis Chalmers. More details to follow. The Reserves are at home to Bamber Bridge this Wednesday (7.45pm at Abbey Hey). The Lancashire League fixtures for December have now been released and are here. Tonight's Reserves' game against Accrington Stanley has been postponed due to a waterlogged pitch at Abbey Hey. Altrincham Reserves gained a deserved 2-0 win last night at home to Marine Reserves in the Lancashire League. Both goals came from Adie Ore (right). Alty Reserves' midfielder Stevie Taylor (left) has decided to leave the club following last night's win over Marine, in which he played as a second-half substitute. Stevie had to be withdrawn in the closing minutes of the game with a leg injury. He has concluded that his work at a gym must take precedence over his availability for regular football and that playing on regularly when he cannot give enough time to football will just lead him to pick up further knocks. He leaves the club having been an excellent and industrious member both of the Altrincham Youth and Altrincham Reserves sides in recent years. Last season Stevie signed UniBond forms and was on first-team stand-by but he did not make an appearance for the first eleven. All at Altrincham and especially Reserves' manager Neil Brown and his coaching team wish Stevie every success in his future career. Altrincham's scheduled away game at Burscough this Friday (12th) has been postponed by the Burscough club. After last week's injury to Stephen Rose, Alty's small first-team squad lost another member last night when striker Peter Wright broke his cheekbone in the Reserves' game against Chorley. Peter is likely to be out for 3 or 4 weeks, according to reserves' manager Neil Brown. Neil's Reserves beat Chorley 2-0 with Wright scoring one and defender Adam Brindle netting the other. Report here. Saturday's match against Leigh was postponed. The next game is at home (Abbey Hey) on Wednesday against Chorley (7.45pm). Thanks to Reserves' manager Neil Brown, there is a brief report of the game last Tuesday at Marine, here. Rain caused the postponement of Saturday's game at Bamber Bridge. Alty Reserves' next match is at home - but to be played at Robin Park, Wigan - against Leigh RMI. The November league fixtures are now here. Last night Alty Reserves drew 1-1 at Marine - their 6th draw in 11 games this season. Amongst the players playing recently for Altrincham Reserves have been several newcomers who are nonethless familiar to Alty watchers. They include the former Northwich Vics' midfielder Val Owen, two-footed winger Steve Torpey who played for the Alty first team earlier this month after signing from Prescot Cables, and midfielder Paul Tilley who has returned to Altrincham after captaining our youth team a couple of seasons ago before he moved on to Trafford and Leigh RMI. Goalkeeper Spencer Liddiard is another returning player, having been at Moss Lane a couple of seasons ago as cover for Richard Acton. The latest addition to the Reserves' squad is Kirk Hilton (23), a Flixton-born former Man. United Reserves' left-back who has been in the USA recently. He gained first team experience whilst on loan from United to Royal Antwerp. In 2002/03 he went on loan to Scottish Premier side Livingston. Other recent newcomers are brothers Michael and Ashley Brown. The Reserves' league fixtures have been updated here. After eight consecutive away games, the lads will have a home game, but it will be played 'away' on the Robin Park Arena adjacent to the JJB Stadium at Wigan on 30 October. The Lancashire League table has been updated again, at the foot of the Fixtures Page, after last weekend's games. On Saturday, Alty Reserves will now be away to Leigh RMI at Wigan. This change is because Lancaster City, their scheduled opponents, have an FA Cup tie at the Giant Axe on Saturday. As Alty were beating Barrow at Moss Lane, Alty Reserves were winning their first game of the season up at Holker Street by four goals to two. The Barrow forum says that "after going 1-0 up, the [Barrow] reserves lost 4-2 at Holker Street this evening. The score was all square at 1-1 at half time before a further 3 goals in the second half from Altrincham sealed the points. Patrick Staunton snatched one back late on". Barrow's Holker Street Newsletter says that "The reserves return home on Tuesday night to what will hopefully be a good crowd when they take on Altrincham Reserves. This will be another opportunity for Barrow public to see the under 18 and reserves players perform their well drilled passing game that is winning admiration of opposing managers this season. Manager Dave Staunton, looking forward to the game, said he believes the mix of players from the under18 side and last season's reserve team players is beginning to gel into a good side, he now hopes the side can build on their last two performances with a home victory". The Lancashire League has given Altrincham six consecutive away games in October; fixtures here. Alty Reserves were due to play Leigh RMI at Abbey Hey tonight but the match has been postponed due to a waterlogged pitch. There is now a brief report on the Guiseley game. Alty's next game is at home to Leigh RMI on Wednesday at Abbey Hey. Rod Thornley, returning to fitness with Altrincham Reserves, scored last night as the Reserves drew 1-1 away at Guiseley in the Lancashire League. Alty Reserves went down to the only goal of the game away to Northwich Victoria yesterday. There is a brief report of the game, in which Rod Thornley made a welcome appearance, here. Altrincham Reserves lost 4-0 last night against Southport at Abbey Hey. Report here..
Alty entertain Southport Reserves on Wednesday at Abbey Hey (7.45pm) and Southport report that their Reserves now have a "new manager, Joey Dunn... [who] comes with much experience. 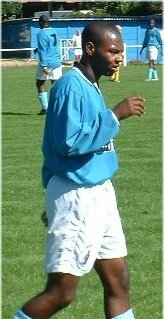 He is a former non-league player and has also managed Altrincham and Runcorn Reserves". 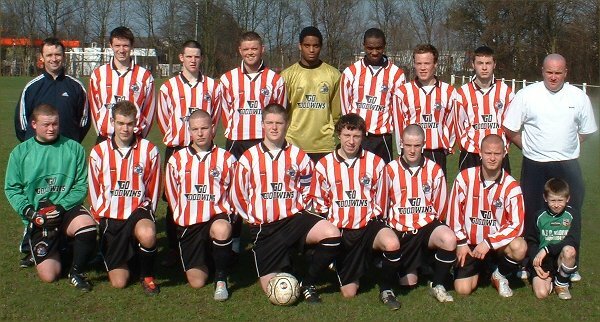 Joey was briefly a player at Moss Lane and returned as Alty Reserves' manager under Mark Ward in 2000-01.